I will be honest, after AMD did not update its FX processor line using the Steamroller architecture, I was not too hopeful for the brand to see anything new in 2014. But since the start of the year the 5 GHz turbo FX-9590 has been rereleased as a consumer part and today AMD is showing it can get four Piledriver modules down to 95W with a few frequency adjustments and cherry picking the dies. This is accompanied with price cuts for the eight-thread FX parts, which AMD is aiming squarely at similarly priced Intel i5 and i3 processors. The new CPUs being released today come in three flavors. The FX-8370 is an upgraded version of the FX-8350, giving an extra bump in clock speeds over the FX-8350 in the same 125W envelope. The other two processors, the FX-8370E and FX-8320E, carry this new ‘E’ designation from AMD, representing their ‘energy efficient’ range. For these processors, this means a four-module die with 8 threads with turbo frequencies matching their non-E counterparts but base frequencies reduced slightly. Part of this makes you wonder just how much energy is used per MHz to hit the high numbers. It only takes a relatively small drop in base frequency to net a large power gain. We saw similar things from AMD with their 65W configurable TDP Kaveri parts earlier this year. The base frequency drop does come across as a larger number than a first glance might suggest. The FX-8370E is 700 MHz lower than the FX-8370, while the FX-8320E is only 300 MHz lower. While I can imagine that 700 MHz reduces the power consumption by 30W, the 300 MHz number might indicate a better binned CPU from AMD. One of the issues AMD will have however is the Turbo mode. In the past, only specific workloads seem to cause the low thread count/high frequencies to kick in, meaning that an abnormal workload will keep the frequency low. Also, unlike on Intel’s side of the fence, the motherboard manufacturers have not embraced MultiCore Turbo on AMD with the same gusto. This is a feature that places all the cores of the CPU in its highest frequency state any time it is not idle in order to allow software to be completed faster at the expense of power consumption and some heat. While this does not affect our testing due to the way we test, it might affect the experience the user has on a day-to-day level by being down on the top turbo mode. Why update the FX line with more Vishera based processors? Can’t we get an update? AMD’s reasoning for these new processors, apart from the slowly increasing yields of the higher bin parts over the past year and tweaking the overall design, is because of the motherboards available on the market. Due to the construction of some of the early motherboards intended for AMD’s no-IGP line, these early motherboards could only support 95W or 125W maximum, let alone the 220W of the FX-9590/9370 behemoths. By releasing an 8-thread Vishera processor with a 95W TDP, this allows these users to upgrade without spending an extra $120-$200 on a new motherboard. With our CPU sample from AMD, we were also sent one of the newest motherboards that shows this limitation. We ran a news item on the 990FX Killer when it was first announced, and it was interesting due to its use of M.2 on 990FX. One of the items I spotted at the time on the specifications sheet was its recommended limit of processors: 125W TDP maximum. 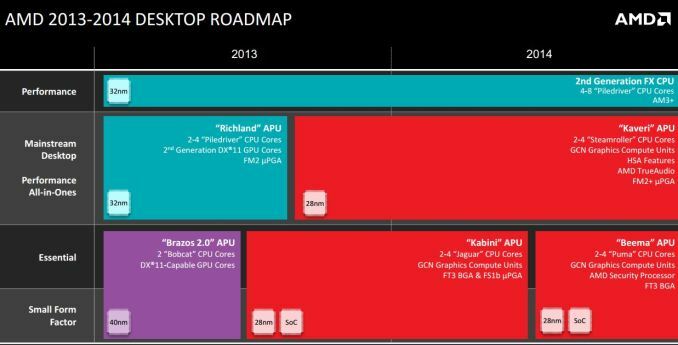 At the time (December 2013) AMD’s Roy Taylor and I discussed this on Twitter. It seemed odd that new motherboards were coming out that would not support AMD’s fastest CPU, even though motherboard manufacturers and AMD’s partners wanted to push the FX-9590 as the top end product. To solve that conundrum, this line of E processors was launched. 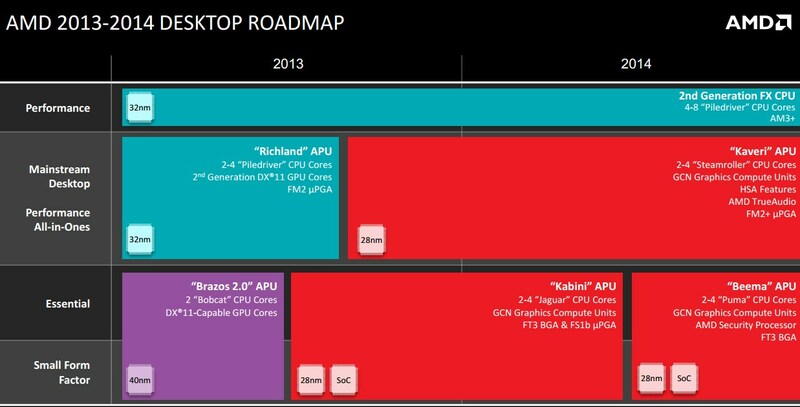 At the moment, AMD’s future roadmaps do not include FX processors based on new architectures, and there is no publicly disclosed new chipset, as we discussed in our recent FX-9590 review. To say ‘today funds tomorrow’ is no big leap of the imagination, but ‘ongoing success’ could stress future updates for the FX line. Now that AMD has started this energy efficient nomenclature, it would make sense to sustain it and introduce it to more of its customers over time. The earliest indication is 2015 for anything slightly new, though it is currently difficult to predict exactly what would be coming. But if we take into context 'products like FX', it might imply that there are no future FX parts, or at least how we commonly recognize them. But for now we have the energy efficient side of Vishera to test. While AMD is stating that the 32nm process for Vishera has been updated and tweaked over time to allow for better yields and more efficient products, they have not stated if the silicon is changed in any way. For all intents and purposes, 32nm is getting a bit long in the tooth in the land of processors – Intel’s 14nm designs and second generation tri-gate transistors/FinFETs are almost upon us and 32nm is some way behind. 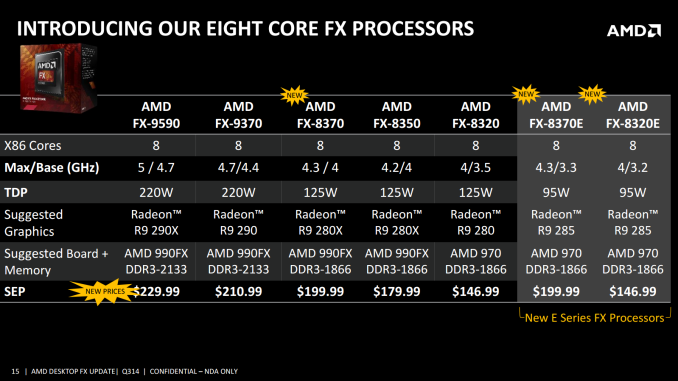 AMD is keeping the new energy efficient CPUs in the AM3+ socket, which means the 990FX is still top of the chain. However, these new CPUs are aimed at the lower end motherboards or even the older chipsets that were not designed to cope with >95W TDPs. In AMD’s briefing, they specifically called out the 700 series that supported AM3 and DDR3, although this applies to 800 series and 900 series equally. The 990FX+SB950 platform combination is still limited to PCIe 2.0 without using a PCIe 3.0 PLX chip, although the connection to the CPU in that orientation is still PCIe 2.0 - only the data between the GPUs is accelerated. 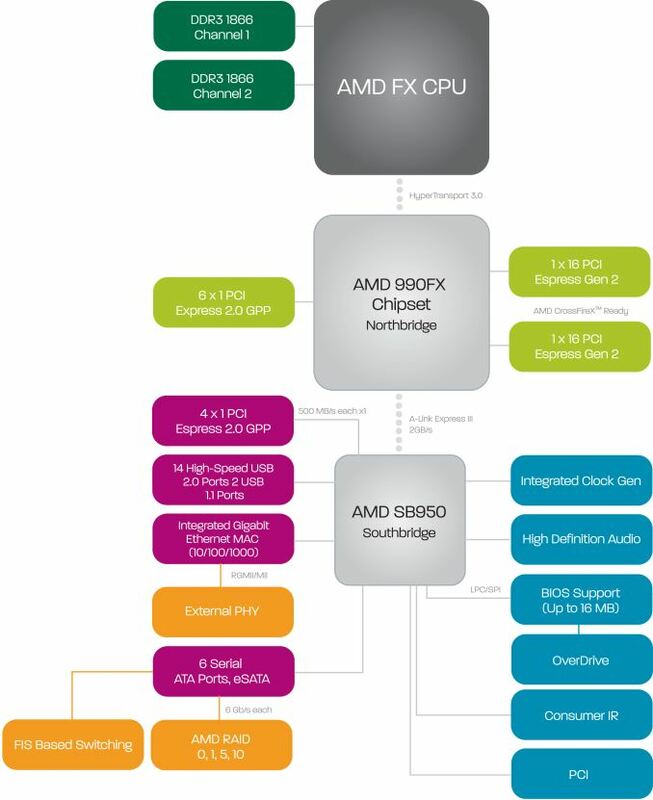 Nevertheless this is still the latest platform from AMD to have SLI support, with the north bridge being able to use two PCIe 2.0 x16 slots. The south bridge gives out the IO, to which we get six SATA 6 Gbps ports that are RAID capable. No native USB 3.0 though, as this combination was introduced before USB 3.0 became a must-have feature. This is one of the common criticisms with AM3+ - it needs a chipset update. There are plenty of PCIe 2.0 x1 ports in order to use USB 3.0 controllers, however this adds cost and AMD motherboards are generally low cost to begin with. It also goes against the mantra AMD is using for the new energy efficient CPUs of keeping the motherboard. Memory is still DDR3, with the new CPUs natively supporting DDR3-1866 MHz under JEDEC specifications. Nevertheless, in AMD’s pre-brief it was stated that DDR3-2133 overclocking should be possible on almost all samples, with DDR3-2400 being a potential. Normal rules apply with DDR3: if you are buying new, buy a single kit with all the modules you need rather than two kits of the same modules. A kit is by definition only designed to work with itself, and it may be too strict on its timings to work with another kit, even if that kit is the same type. That is why four module kits often have a lower specification than a dual module kit. If the kit cannot combine with another kit at the rated settings, it can be a hard problem to diagnose. However the DDR3 market is quite mature at this stage, with plenty of options available. There are many ways in which a manufacturer can order up the competition. We could have 8-thread CPUs against 8-thread CPUs, or we could put 95W CPUs against 95W CPUs. For these processors, due to the accompanied price reduction across most of the FX desktop line, AMD is deciding to compare setups based on price. This slide AMD provided is rather amusing. 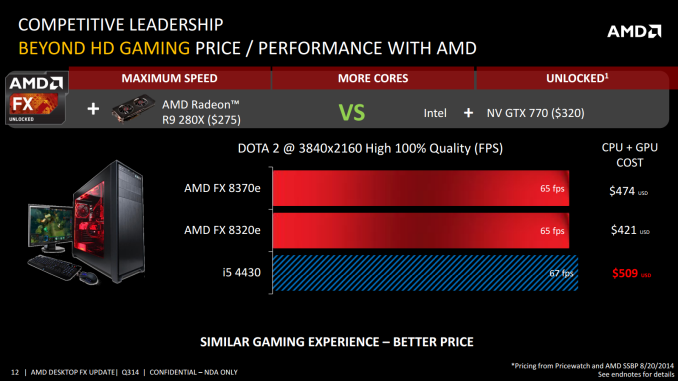 It shows that an FX-8320E + R9 280X will perform similarly to an i5-4430 + GTX 770 while being $88 cheaper. This is despite the DOTA 2 benchmark being performed on a UHD monitor which would cost just as much. But then again, perhaps that extra $80 could be going on an SSD – AMD’s focus over the past few years has always been oriented towards the cost effectiveness. 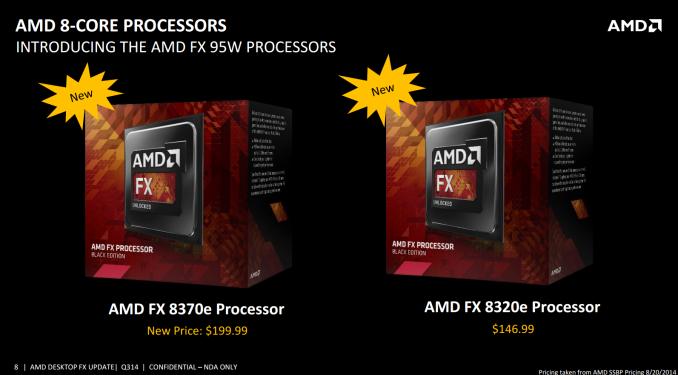 In real terms, the FX-8370 sits between the FX-8350 and the FX-9370, and the FX-8370E/FX-8320E are both equally priced to their non-E counterparts. The tradeoff is that for the lower TDP option, you pay a bit more compared to if we just looked at the speed. Unfortunately AMD’s pricing is not telling the whole story. For the FX-9370 and FX-9590, that pricing is for the CPU-only version, whereas the FX-8370 and below pricing includes a boxed cooler. AMD’s reasoning on this is that for users buying the 9000 series, even with the price cuts, many of them will either purchase the version with the all-in-one liquid cooler (+$80 or so), or use their own after-market cooling in order to deal with the 220W TDP. At the high end, the FX-9590 has competition with the i5-4670K although with twice as many threads in tow. At the FX-8370 level, the pricing of both the Core i5-4590 and the S model would make for an interesting battle if we had these CPUs in to test. 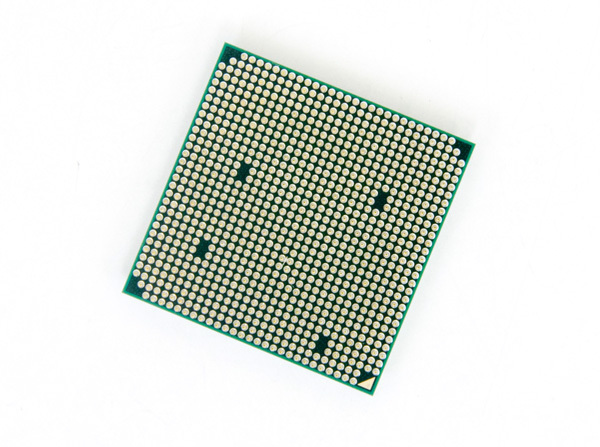 For the FX-8320E, we are split between two Core i3s, meaning that the i3 with two cores and HyperThreading is up against a full 8 threads from the FX-8320E. 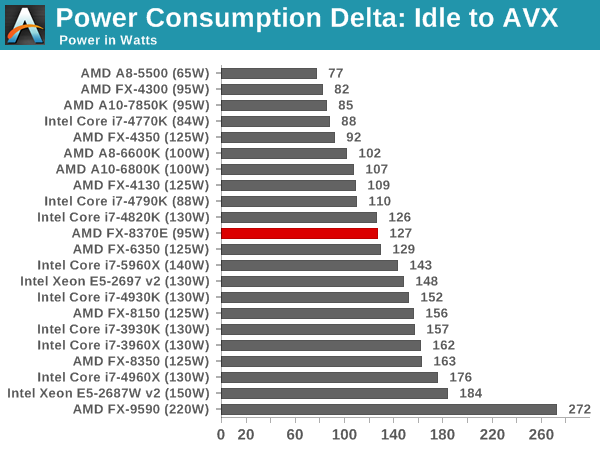 While this seems one sided, the i3’s power consumption is almost half that of the FX processor. AMD is also keen to point out that all of its CPUs are unlocked for overclocking, unlike the competition where it is limited. At this point in time AMD is currently only sampling the FX-8370E to the press, with the other CPUs to follow later this month. Due to our sample arriving only yesterday, this aims to be a quick overview of performance against other processors we have already tested. Note we only have a few from the list above, but as the new processors arrive we can aim for a more targeted punch-counterpunch scenario with overclocked testing. Our testing today encompasses the usual array of CPU and gaming benchmarks at stock speeds and official supported memory frequencies. Thank you to OCZ for providing us with PSUs and SSDs. Thank you to G.Skill for providing us with memory. Thank you to Corsair for providing us with an AX1200i PSU and a Corsair H80i CLC. Thank you to MSI for providing us with the NVIDIA GTX 770 Lightning GPUs. Thank you to ASRock for providing us with some IO testing kit. Power consumption was tested on the system while in a single MSI GTX 770 Lightning GPU configuration with a wall meter connected to the OCZ 1250W power supply. This power supply is Gold rated, and as I am in the UK on a 230-240 V supply, leads to ~75% efficiency under 50W and 90%+ efficiency at 250W, suitable for both idle and multi-GPU loading. This method of power reading allows us to compare the power management of the UEFI and the board to supply components with power under load, and includes typical PSU losses due to efficiency. We take the power delta difference between idle and load as our tested value, giving an indication of the power increase from the CPU when placed under stress. I retested our very early FX-8150/FX-8350 samples again for the power tests due to lack of data, and even though the result was very high over several tries it was consistent. Thus the power saving by comparison, switching to the efficient processors is great, but the latest AMD architectures perform best. Hey, be nice to AMD. These new processors are totally competitive with Intel...'s Sandy Bridge processors from 3 years ago. Don't get me wrong, I sympathize with underdogs, and especially considering in the case of AMD, it was decades of Intel's anti-competitive practices that have pretty much doomed AMD to be a perpetual runner up, but I can't deny the obvious. AMD is where Intel always wanted it to be - a handicapped "competitor", barely enough for Intel to say "we are not a monopoly". I've been a long time AMD consumer, but today it is not worth it, maybe on the low end where power consumption is not that much of an issue and the lower price may make some sense, at least in the short term. But ever since I became a prosumer, AMD CPUs simply have nothing to offer. Radeons are pretty neat though, since they offer tremendously better DP performance for the buck. Seriously, how hard is to make a decent CPU... Intel surely has a manufacturing lead as well, but the poor performance of AMD is mostly because of the inferior design, process might give Intel 20-30% advantage, but the rest is all the design. On a side note, the CPU performance stalling is actually a good thing, even if AMD was competitive, there are physical limits which CPUs will hit soon, not to mention Intel has already reached the point the chips are too small to displace that much hear efficiently. I remember I used to upgrade CPUs every 18 months or so, but now I have a 2 year old CPU that is only a notch slower than the latest and greatest. "not to mention Intel has already reached the point the chips are too small to displace that much hear efficiently." "Moore's "law" is a dud, it is obvious that performance"
Seriously, to imply that an IPC should double in performance every 24 months is ridiculously impossible. Even so, that is impossible just as well. This would require that transistors can get infinitely small, which is simply not the case. There are limits to how small a transistor can be, and even in the case of insanely slow and expensive atomic assembly transistors will still be several atoms big, and that won't even make it in mass production. Moore's law IS A DUD and only applies to a short interval in time, Moore apparently didn't look far enough into the future, and made a foolish assumption transistors will keep shrinking perpetually, and even considering how thick chips were back in his days is no excuse for him making such a statement, nor is there any excuse to people who like religious zealots believe it will hold forever. If you bother to actually map transistor size vs time you will not get a straight line but the half of an inverted bell shaped curve, indicating initially slow transistor shrinking, gradually speeding up towards the middle and gradually slowing down to a complete halt the decade or two.